Little Falls, MN are doing things right! These two lovebirds, grew up loving and training dogs! Now — husband and wife team, putting their passion to work, the two have created a one-of-a-kind gun dog training facility, as well as game hunting preserve! Back in 2008, my German Wirehaired Pointer received her first gun training at Willow Creek Kennels. After 4 weeks, my dog came home knowing exactly what to do! She even hunts ducks! This is because Chad took the time to introduce Abby to waterfowl, as well as upland game. Today, when my dog Abby is not in the field, she’s hiding stuff in the backyard and then pretending to find it! Perhaps this wasn’t part of her training…but after visiting with Willow Creek Kennel’s skillful trainers…You’ll soon understand how serious they are about your young pup and providing the right start! You can learn more about Willow Creek Kennels by clicking here! Tell’em Fat Man’s Landing sent you! It was a great trip last weekend! I can’t believe I was still able to travel after being up most the night for my 40th birthday party! That too was a wonderful time and I appreciate everyone’s partake in the celebration. Scott K. and I traveled to Windom, MN last Saturday as we always do this time of the year. It’s pheasant hunting at it’s prime. We met-up with Adam, Derek, Eric, Josh, and Tony at a little motel near the end of town. It takes about an hour and forty-five minute to drive from the cities. That first cup of coffee and the excitement of being in the field kept us awake. After a bite to eat at Micky D’s we were off to one of the local Wildlife Management Areas. We didn’t get too far out of town and I spotted a rooster in the ditch. We pulled off the road and quickly got out our guns. Abby and I walked to where I saw the pheasant. As we drew closer, it launched in a flurry of feathers and laughed with a cackle, as I got three quick shots off. It didn’t look like I hit it, but as the bird flew away it hit one of the power lines and fell to the ground. I couldn’t believe it! I walked over and picked it up — my first pheasant of the day! I ended up shooting six rooster, but only recovering three. It was a great trip and we’ll do it again next year! 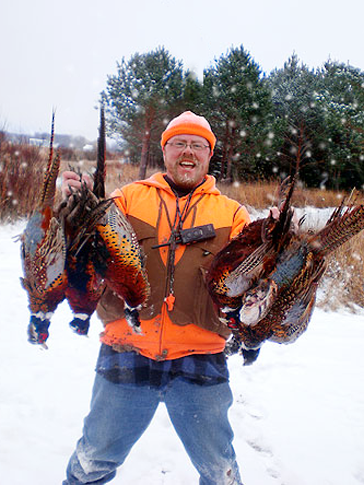 Oh, by the way…we didn’t hunt Sunday, because most of the crew was hung-over from parting the night before at the Phat Pheasant Steak House and Saloon. Hey Derek! Did you have the Phat Pheasant? How was it?